I still haven't read Hillbilly Elegy, but this feels like a good companion book. 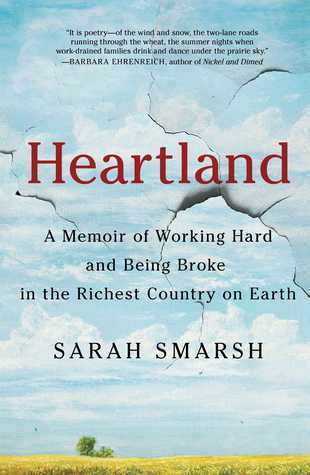 If you, like me, are still wondering how and why the middle and especially lower classes can feel so foreign--fearful, insular, and rejecting of intellect--this book gives an excellent glimpse in, through Ms. Smarsh's own family. Sarah grew up on a farm in Kansas. She was the result of multiple generations of teenage parents. Her grandmother was 34 when she was born. Her mother and grandmother both had professional jobs in the city. When her farm couldn't support her family anymore, her dad had to get a "real" job, and he got poisoned by chemical fumes which caused permanent brain damage. Her parents' marriage probably wouldn't have lasted anyway, as you could tell from the very beginning that her mother felt incredibly trapped (more by her kids than her husband but they were a package deal). But that didn't help. The one good thing was that Sarah's parents' marriage was the first one in many generations that didn't have any physical violence in it. One thing I didn't like about the book: it's written as a letter to Sarah's never-born child. Not just her unborn, but the child she will never have. The child who would have ruined her prospects and trapped her in a life like her mother's and her grandmother's and her great-grandmother's. She spent her entire teens and twenties trying to prevent this child from existing, and she succeeded. I get her thought process here, even if it's rather weird, but I didn't find the conceit very successful. It was off-putting and kept pulling me out of the narrative whenever it resurfaced. It's not a big part of the book--just a few lines at the beginning of every 10th chapter or so, but it's distracting, especially at the beginning of the book. But other than this detail, the book did an amazing job of making the Americans living in farm country, interesting and accessible to those of us on the coasts. This is a good conversation to start. I got a copy of this ARC for free from a friend who is a rep for the publisher.